Olivia, which opened about a month ago, is a chic Mediterranean restaurant with some of the coziest seating in the District. With tables on top of each other and booths you can barely shout across, sometimes restaurants can be less than romantic. You can always occupy the same side of the booth or wait until later to get cozy. But this Valentine’s Day, you can plan your celebration at one of the restaurants in D.C. with seating options that allow you and your significant other to cuddle up next to each other. With an a la carte menu that is always changing and a welcoming interior with dim lighting and a small open kitchen, Bad Saint offers upscale Filipino dishes and cocktails in an intimate environment that only seats about 20 people. Barstool-style seating throughout the restaurant allows couples to sit side-by-side and each seat is padded with bright pink or turquoise fabric so the seats are still comfortable. As you snugly sit next to your significant other, you can try a new cuisine together. The menu is split into gulay, or vegetables and salads, isda at iba pa, fish dishes, and carne, meat options. You can order dishes like laing ($26) with lobster, bitter greens and coconut milk, or pancit miki ($18), a traditional Filipino noodle dish topped with chicken. Diners previously had to wait outside in the cold for a seat at Bad Saint, which is a sure-fire way to make a date go south. But now individuals can attempt to get a reservation before resorting to waiting for a walk-in spot. While hearty portions are not usually romantic, the warm interior of Rare Steakhouse’s formal dining room will not disappoint your Valentine’s Day date. With rich wood-paneled walls and leather booths, Rare Steakhouse is both classy and comfortable. This Valentine’s Day, request one of Rare Steakhouse’s brown leather U-shaped booths so you and your partner can snuggle up next to each other instead of craning across a table to talk or hold hands. 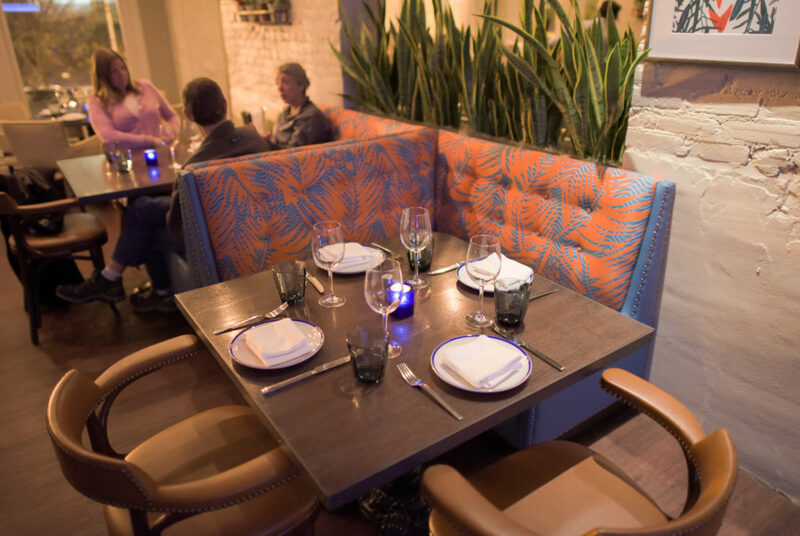 The booths, which can seat up to four people, are also perfect for a double date. The steakhouse offers a wide selection of dry and traditionally aged steaks, which range from $45 to $350, depending on the size and cut of the meat. For slightly less expensive options, Rare Steakhouse has seafood dishes like Bay of Fundy salmon ($32) with artichokes or grilled branzino ($38) with parsley root puree, honey mushrooms and bok choy in a red wine ponzu sauce. To top off your meal, the dessert menu has a variety of choices from bananas foster ($14) to bittersweet chocolate pot de creme ($10). The restaurant’s modern interior features eclectic art, hanging lamps and plants scattered across the restaurant and it is airy and bright during the day. But when the sun goes down, Olivia’s dim lighting creates a warm atmosphere. L-shaped booths in the space have cushioned backs and allow couples to sit knee-to-knee for maximum intimacy on the most romantic day of the year. Olivia typically serves an a la carte menu, but the restaurant is offering a Valentine’s Day four-course prix fixe menu for $75 per person where guests can select one item for each course – an amuse bouche, a bite-sized hors d’oeuvre to prepare your palate and a glass of sparkling rose, plus an appetizer, entree and dessert. Appetizer selections range from poached scallops in smoked olive oil to lamb tartare with preserved lemon, while entrees include dishes like New York strip steak with potato pearls and spinach and chorizo-crusted cod. Finish your meal on a sweet note with pistachio souffle with rose sorbet or hazelnut truffles – both bites you can share with your date. If you are looking to take your Valentine’s Day dinner experience to a new level of luxury, winter igloos are available for rent at the Watergate Hotel. Located on the patio of the Watergate’s The Next Whisky Bar, each igloo is heated for guaranteed coziness. The 12-foot domes are fully furnished with armchairs, fur rugs and twinkly lights and candles, making a picturesque romantic atmosphere. Rental fees range from $100 to $250 and food and beverage minimums range from $50 to $75 per person. Cocktails range from “The Soft Parade” ($16) with whiskey, lemon, spice syrup and ginger beer to the “Chief Makers” ($16) with bourbon, lemon, raspberry and honey. For food, igloo guests can order bites like spicy pork and veal meatballs ($16) with polenta and onion jus, fried chicken wings ($16) in Korean barbecue sauce or apple cider doughnuts ($12) with apple chutney and glaze. Although the experience is on the pricier side, the igloos create privacy for an intimate evening of kissing and hand holding.